The City of Raleigh has around 1,100 employees and in downtown, you can find them in a variety of places. One Exchange plaza on Fayetteville Street, behind the old Raleigh Union Depot facing Nash Square, and the City Hall block are just a few of them. In May, the city started discussing the possibility of consolidating those spaces, possibly others, into a downtown municipal campus. The idea is to plan for new growth in a cost-effective way. The process to get there might involve selling off some city-owned properties. Right now, the thinking is to build this new campus on the current site of City Hall, the block bounded by Hargett/Morgan and McDowell/Dawson Streets. It would be paid for, partially, by selling some of the properties mentioned above and possibly others. By looking at data from iMaps, I created this map of city-owned property in the downtown area. For completeness, I searched for two terms, “City of Raleigh” and “Raleigh city of” to get those properties. There may be more but this covers a good amount. I combined a few together where it made sense and did not add some individual properties that I would consider to be in the East Downtown neighborhoods. It’s interesting to see how much land there is but some of it makes sense with all the parking decks and cultural places like the Performing Arts Center and the Convention Center. The city owns, basically, zero properties in Glenwood South. At this time, the city will work on landing a consultant to help with the process. Long time readers may be experiencing Déjà vu here as the city has gone through a similar approach in recent history. Consolidating offices into a downtown tower, the Clarence E. Lightner Public Safety Center, was a big controversy in 2010. It eventually was scrapped as the cost, around $225 million, was seen as too high, among other concerns. I’m open to it though as the Downtown Raleigh plan makes a few recommendations for this area. That last one brings it home. 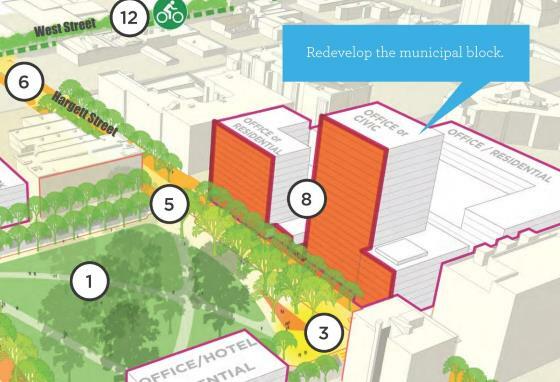 In fact, the entire idea of redeveloping the City Hall block is right in the plan itself. Hopefully, the consultant is shown this plan and can create active edges, especially along the Hargett Street side. Office space and parking will most likely be a part of the “campus” plan so to create more active streets and sidewalks, ground-floor retail space and an interior parking deck would be great elements of the plan. If the city were to consolidate their personnel into a singular building or urban campus, it would make sense for the city to drive (no pun intended) a pedestrian and retail foundation in their immediate neighborhood to enhance the day to day experience of their employees. These employees will require basic services such as dry cleaners & tailors, breakfast/lunch restaurants, office supplies/shipping, etc. As the city grows, more specialty retail can be supported by workers during the weekdays and residents and revelers during evenings and weekends. I can imagine a city campus with public retail at the street level to encourage community engagement. Hard to have any outside retail space in a city complex and have a secure complex. I don’t agree with a new complex at RMB site as where will the 1100 employees park? Oh I forgot they will ride their bikes on the new marked bike paths. The City does not provide parking except for the mayor and top management. The rest of the workers park 5-6 blocks away on Bloodworth Street or pay $110 a month to park in a city owned deck. Remember Police pay starts at $34,000. Sell the complex for 10-15 million and move on or provide free parking which they won’t. The N & O site is about to be unveiled. 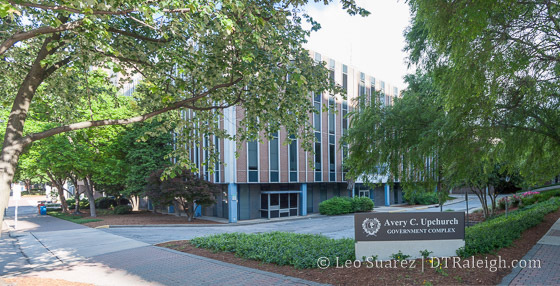 Then you also have 400 block Hillsborough Street, Kane’s Dillon Bldg & smokey hollow (grocery & 400 apts.) The hotel at Glenwood & Hillsborough & Morgan so too much activity to allow a 20 story municipal office complex and 8 story deck to house them. Is there a developer in mind? I would think the campus would have to be done in phases. Expand the parking deck first, construct something fairly tall on the PD lot so you could move some employees from other buildings for selling, then maybe another tall one where the city hall is to relocate all other workers. And I nominate Mr. Kane to develop it so it will get done in our lifetime! @BC, I disagree that a secure urban facility can’t have retail at the street level. Consider the RedHat tower as an example. RedHat occupies the upper floors accessed by a central street level lobby. Flanking its lobby to the west and east under the tower and its parking are individual retail establishments that are primarily restaurants. They coexist just fine while not threatening the security of RedHat’s HQ. I agree with Robert that parking will have to be considered for city employees in any urban model. That existing parking deck is a goner. Part of the previous phasing included getting rid of that thing. It would fly in the face of current established City policy to simply “expand” a parking deck. They push active frontages on everyone and would most certainly aim for this themselves. I think you’d likely see the phasing as 1) medium size tower with parking incorporated in the structure on the site of the old police station. 2)removal of the current parking deck followed by 1 or 2 more buildings. 3) 20+ years out the current City hall would finally get replaced with a taller, more modern building. 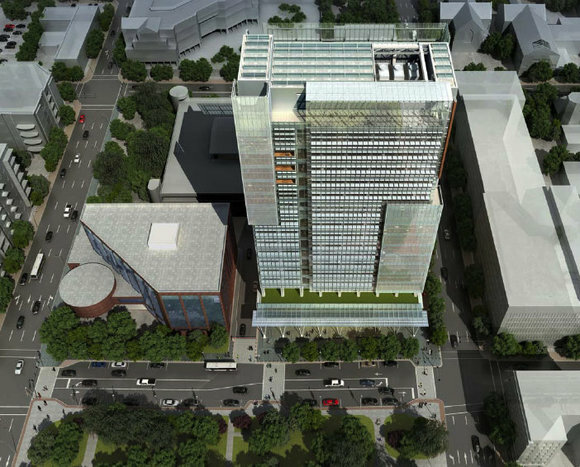 The city will be smart to incorporate retail and a parking deck that can be accessed by employees, residents, and visitors to the Nash Square area and the Warehouse District. Additionally, the city should actively support programs that support use of transit by its employees and other major employers. I thought I caught that but didn’t look into it. Thanks for sharing!